Abruzzo is one of the regions of Italy I do not get to often. For the past 10 years, the local grape growers have used the Filone system of training vines which I had never seen. I am familiar with the traditional Tendone system used in Abruzzo, Puglia and Campania, and I knew that Cantina Frentana utilizes both these methods to train their vines. I was very happy to accept their invitation to visit the winery to learn just how they do it. But I was in for a surprise. Cantina Frentana also utilizes a third method for training vines called La Pergoletta Abruzzese. Felice Di Biase, the sales manager, greeted us and told us the program for the week. As we approached Cantina Frentana, I noticed a tall cement tower rising high above the winery. 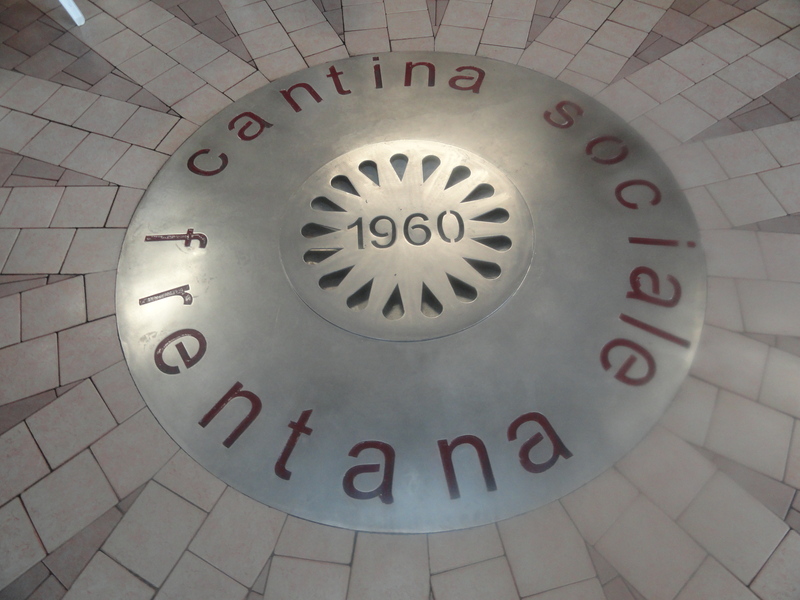 Located in Rocca San Giovanni in the province of Chieti in the southern part of Abruzzo near Lanciano and close to the Adriatic Sea, Cantina Frentana is a co-op made up of 400 grower-members. I wondered what the purpose of the tower was. Entering the winery I looked up and could see that the tower is made up of glass lined cement tanks stacked one on top of the other. The enologist Gianni Pasquale said that it is 30 meters high and the tanks were at one time used to ferment and store the wine. Now only the uppermost tanks are used for storage. Cantina Frentana’s vineyards are located within the boundaries of the village of Frentana, southeast of the Apennine Mountains near the city of Lanciano in the southern part of Abruzzo. The soil was described to me as being generally muddy and sandy. The coastline is called the Costa dei Trabocchi. 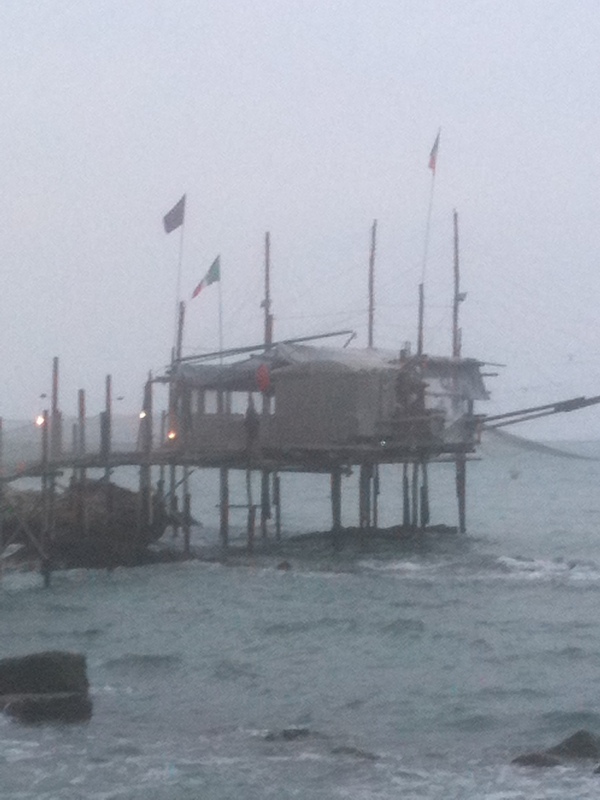 Trabocchi were dwellings used by fishermen so they could fish in bad weather. Made of wood, they stand in the water on long wooden legs with long poles and nets reaching out into the water. Some have been turned into restaurants and in fact one night we had an excellent dinner in the traboccho of the co-op’s President, Carlo Romanelli. 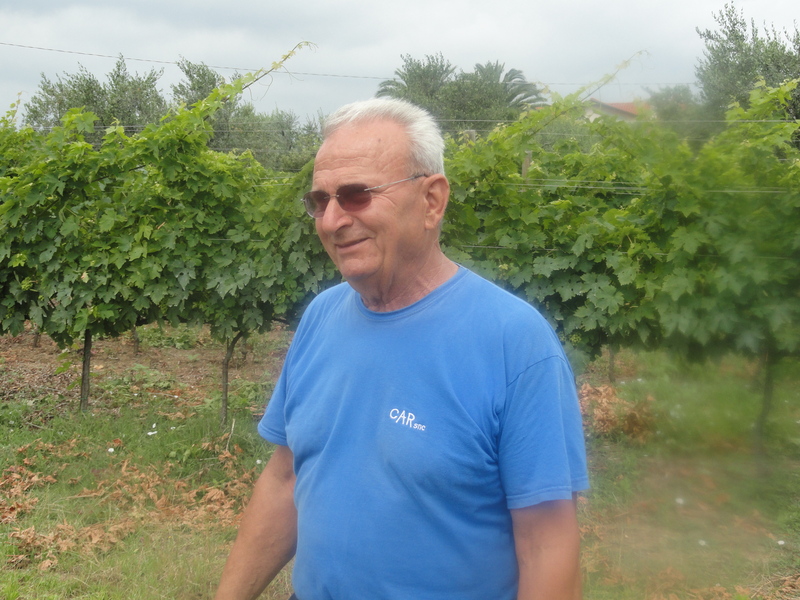 Felice Di Biase, told me that the members (growers) are assisted throughout the entire grape growing season, right up to harvest by the co-op’s agronomist Maurizio Piucci and the Mr. Pasquale. Only 10-15 % of the wine is bottled, and the rest is sold in bulk. The bottled wine comes from the best 100 producers and they are paid more for their grapes. I asked Mr. Di Biase who their customers were for the bulk wine and he just smiled. The Cantina produces 15 million liters of wine. I was impressed by how knowledgeable and open everyone was. 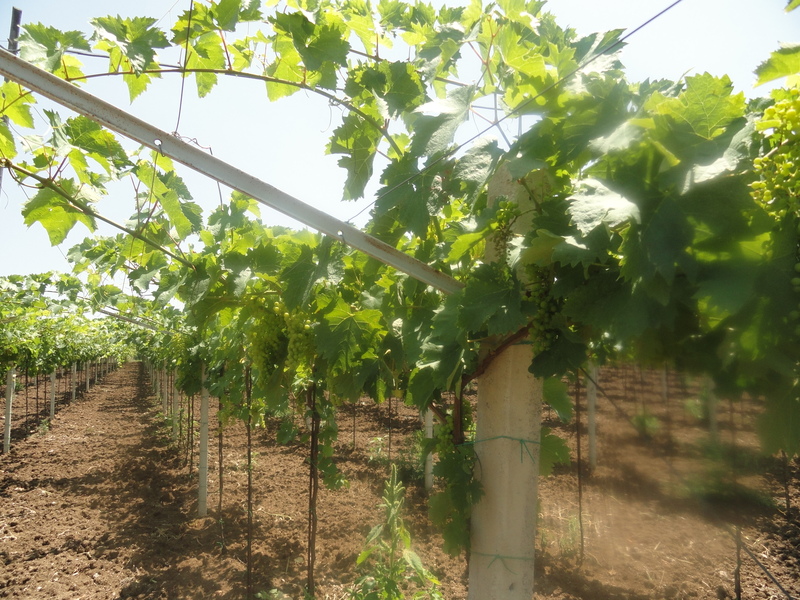 The traditional vine training method is the Tendone system also known as Pergola Abruzzese. The vines are grown along vertical posts and wires to a height of about 6 feet. The vines are planted 2 meters apart in parallel rows 2 meters apart. 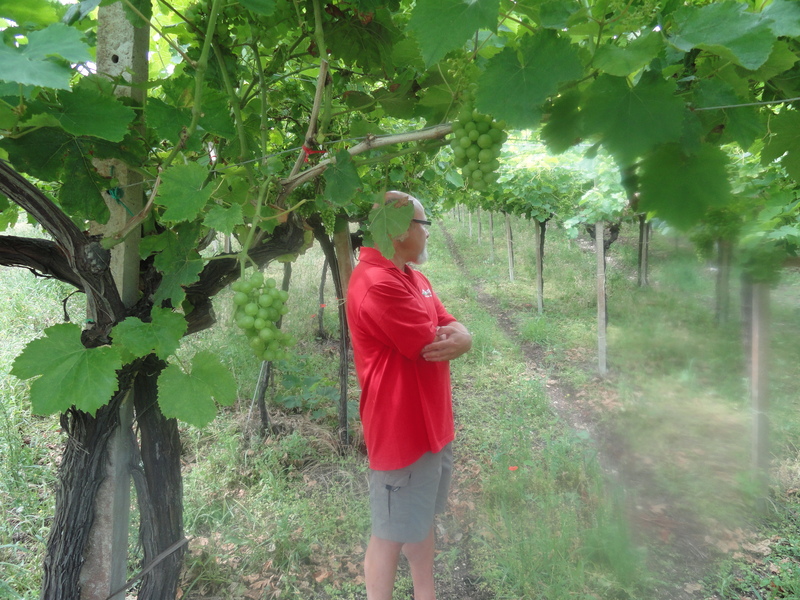 The leaves grow over the top to form a canopy (pergola)to protect the grapes from the hot Abruzzo sun. The Tendone has always been the way to grow table grapes in the area and it is easier to pick the grapes without having to bend down. About ten years ago another method was introduced called the Filone system. The vines are planted in rows 2 meters apart and look like big shields full of grapes and leaves. The leaves hang down and give the grapes some protection from the sun. Many feel it is not enough protection. It is easier to machine harvest with this system because of the straight line of rows. Mr. Piucci said that the Tendone is better on hilly terrain where it is more difficult to use machines. 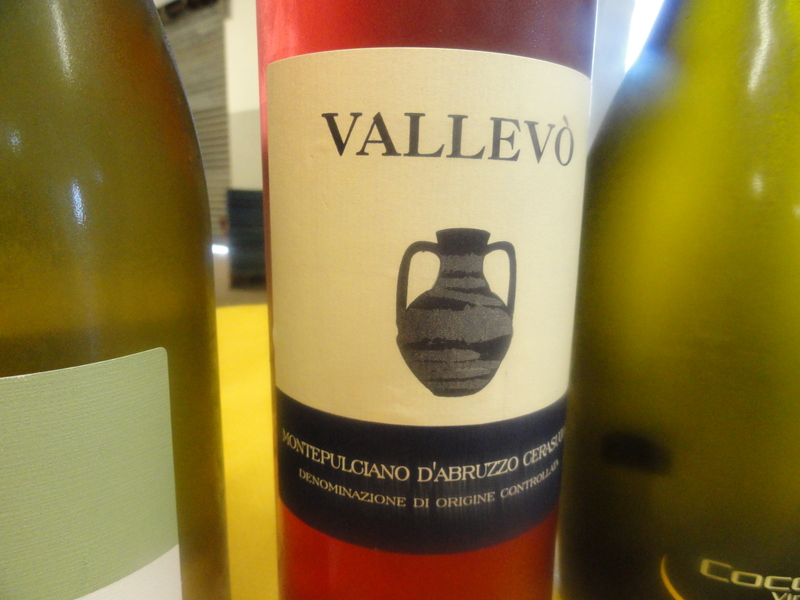 The third method, called La Pergoletta Abruzzese, was devised in a collaboration between Cantina Frentana and the Consorzio Agrario e Valente Pali. The collaborators felt there was a need to increase the number of vines per hectare and to produce what they believe to be better grapes. The method is similar to the Tendone but with a few differences. Each plant has two shoots instead of the traditional four. The distance between the plants is less. If I understood correctly, it is 1 meter 20 centimeters, but the distance between the rows is the same. They feel that this system lets in more light and lets out more humidity so they will get better grapes. It is only used for the Montepulciano grape. This will be the first year that wine will be made from grapes using this system. There are 3,200 plants per hectare which is more than the Tendone (which ranges from 1,100 to 2,200 vines per hectare). The top grape grower for Cantina Frentana will not change to this system. 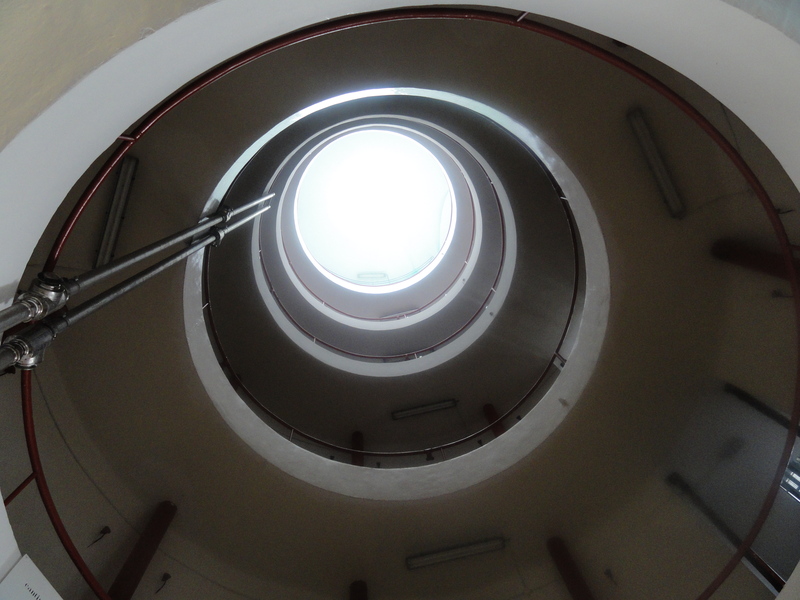 It is more expensive because of the zinc iron that is used in the construction. Maybe the grower is waiting to see what happens, and if you are already number one, why change? Cantina Frentana makes a few different lines of wines but the one I liked best was the Vallevo’ imported and distributed by Franco Bengasi from Wine Emporium. 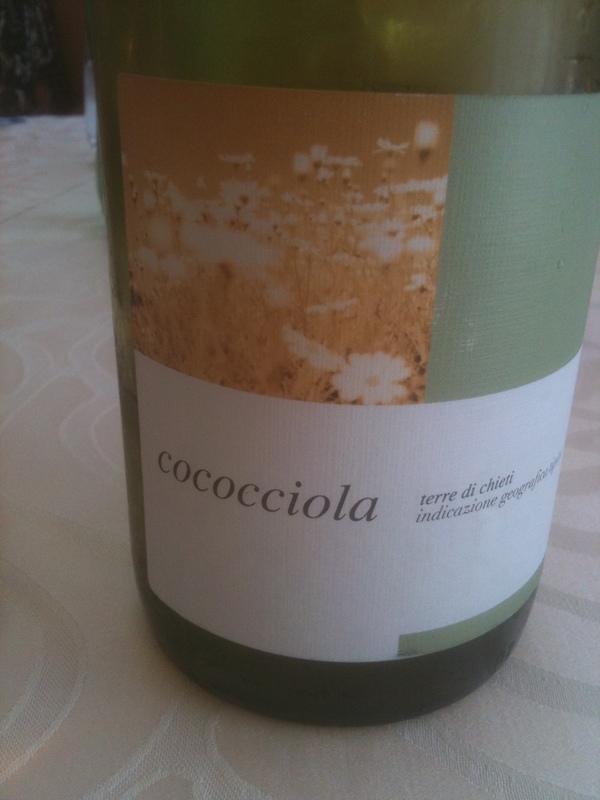 Cococciola Terre di Chieti 2010 IGT 100% Cococciolo. This is an ancient indigenous grape variety of the province of Chieti mainly grown in the area around Rocco San Giovanni. The big grape bunches are irregular in shape and some are wing-tipped. It is a grape with good acidity and good yields. In the past it was only used for blending with other grapes. The harvest takes place towards the end of September. The grapes are soft pressed and fermentation takes place in stainless steel tanks at controlled temperatures. Malolatic fermentation does not take place. The first time I had this unusual white wine was at Keste Pizza &Vino in NYC and I liked it right away. There is a slight herbal and mineral character to the wine, good body with aromas and flavors of apple and citrus fruit. Cococciolo Sparkling Brut Terre di Chieti IGT 100% Cococciolo. Only the free run juice is used. This is an interesting sparkling wine made by the charmat method with citrus flavors and aromas and a hint of almonds. 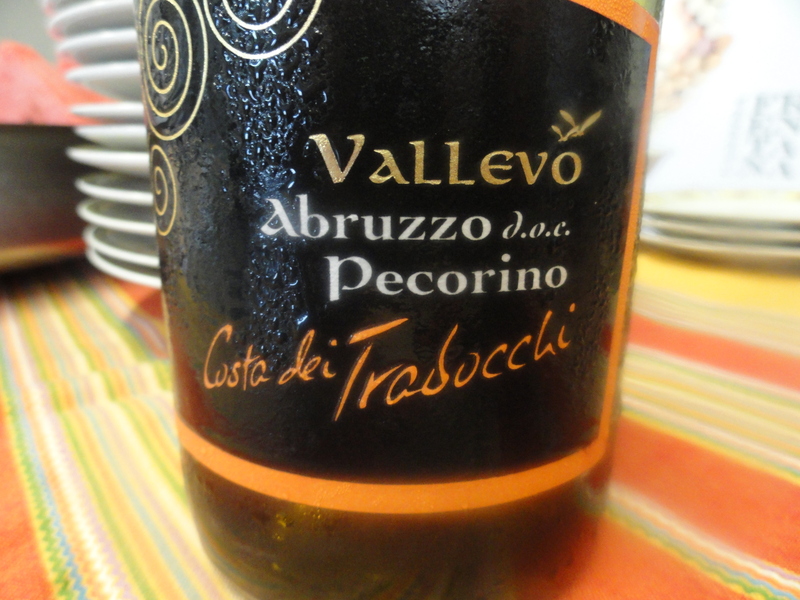 Pecorino2010 DOC Abruzzo-Costa del Trabocchi . The grapes are crushed and have a short period of cryo-maceration of 6-7 hours and then soft pressed. Fermentation takes place at controlled temperatures in stainless steel tanks and the wine is refined on the lees with periodic remontage. Special yeast is used and the wine does not undergo malolatic fermentation. This is a medium-bodied wine with citrus aromas and flavors of lime, lemon and almond. The wine may have gotten its name because the sheep (pecora) coming down from the mountains were said to eat these grapes. Chardonnay IGT 2010 100% Chardonnay. Fermentation takes place in stainless steel tanks. This was my kind of Chardonnay — all stainless steel and no malolatic fermentation, the way I like my Chardonnay! Trebbiano D’Abruzzo 2010 DOC 100% Trebbiano d’Abruzzo. The vines are 15-20 years old and have a North/North East exposure. The grapes are soft pressed and native yeasts are added. Fermentation takes place in stainless steel tanks at controlled temperatures. Malolatic fermentation does not take place. The wine is aged in stainless steel for five months before it is bottled. It has aromas and flavors of citrus fruits and green apple with good acidity. Montepulciano D’ Abruzzo Cerasuolo DOC 2010. The vines are 10-15 years old with an East/South-East exposure. Fermentation talks place in stainless steel tanks at controlled temperatures. The skins are in contact with the juice for 12 hours. This is a rosé with a very deep color. It has flavors and aromas of strawberries and cherry. Montepulciano D’Abruzzo 2009 DOC 100 Montepulciano D’Abruzzo. The soil is muddy clay and the vines are 5-15 years old with a West/South West exposure. After a soft pressing, fermentation takes place with the skins for 7 to 10 days depending on the vintage. Malolatic fermentation takes place in stainless steel. It has aromas and flavors of fresh red fruit with a hint of prune and it should be drunk young. 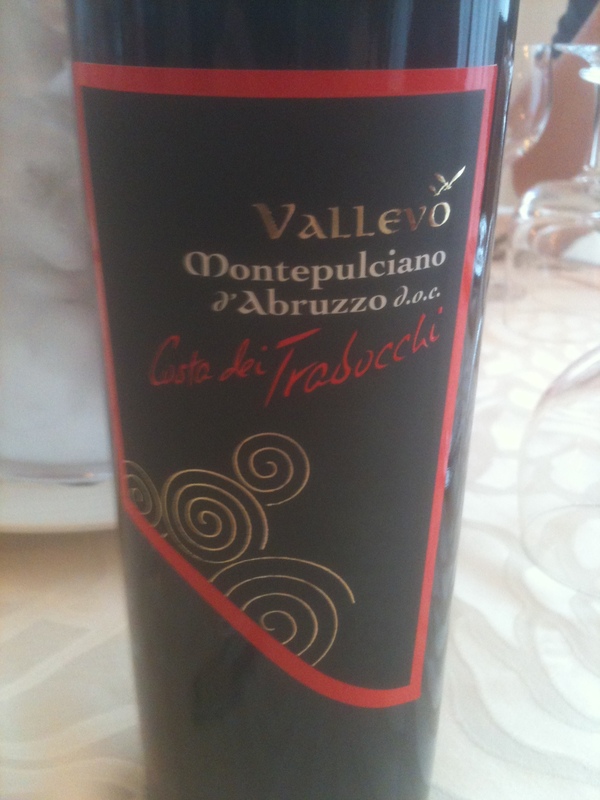 Montepulciano D’Abruzzo DOC 2008 Costa Dei Trabocchi 100% Montepulciano D’Abruzzo. The soil is mostly clay and the vines are 10-15 years old with a West/South-West exposure. The grapes are soft pressed and fermentation takes place in stainless steel with skin contact for 10 to 15 days depending on the vintage. The wine is aged in 500 liter barrels of Allier oak and may see some second passage barriques for 12 months. The wine has aromas and flavors of violets and black cherry with a hint of vanilla.